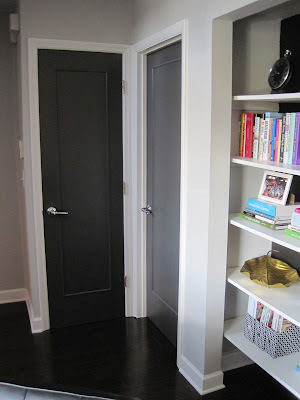 This is for if you have those plain flat hollow core doors in your home...rather than spending lots of money having them all replaced you can add simple molding to dress them up! Here is what my doors looked like before...plain white with white trim...not horrible but nothing interesting either. First lightly sand the entire door to have a rough surface for the final coat of paint to stick to. Next, I measured where I wanted my molding to be placed on the door. I brought the sides in 4.5", the bottom was 10" from the floor and the top was 75" from the floor. Instead of measuring the top piece from the top of the door measure from the bottom. 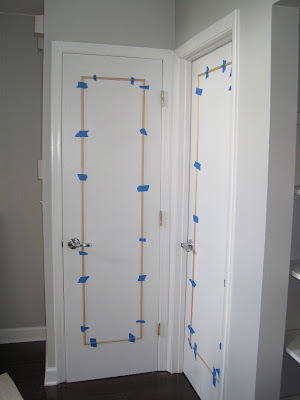 Most doors are not all perfect but this will keep the molding lined up when two doors are close together and will trick the eye that all of your doors are exactly the same! After marking some small pencil marks where I wanted the molding to go I measured my molding, cut, and taped in place with painters tape. Go through and do a rough check with your level in several areas. You can then loosen the tape on one side only to add your wood glue. This will help keep everything lined up. Some may want to use a nail gun to attach. My molding was so small and light weight it did not need it and has held up great. Tape the loose side back down. Take a damp paper towel and wipe up any glue that is bulging out the edges. After the glue had dried you will caulk all the seams, let dry, then prime and paint! Ta da! Before and after! om, yup, they look amazing! I love it! 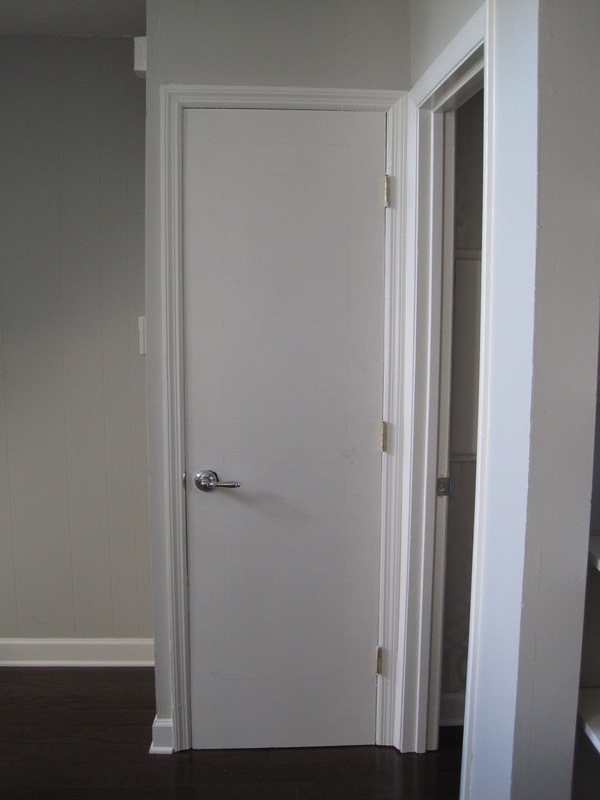 I've been thinking of painting my pantry door a color. Even chalkboard paint could be fun in the insert of one of those doors! Seriously, this is awesome! What a huge difference! Looks great!! Did u do that to just bedroom/bath doors or closets also? Thanks. I did every door in the house unless they were bifold.